Back when I was a quarter-life cook, not a healthy hedonist, I was all about finding creative ways to cook for one. I was not gluten-free at the time, so that creative way often involved carbs. And that carb was usually pasta. 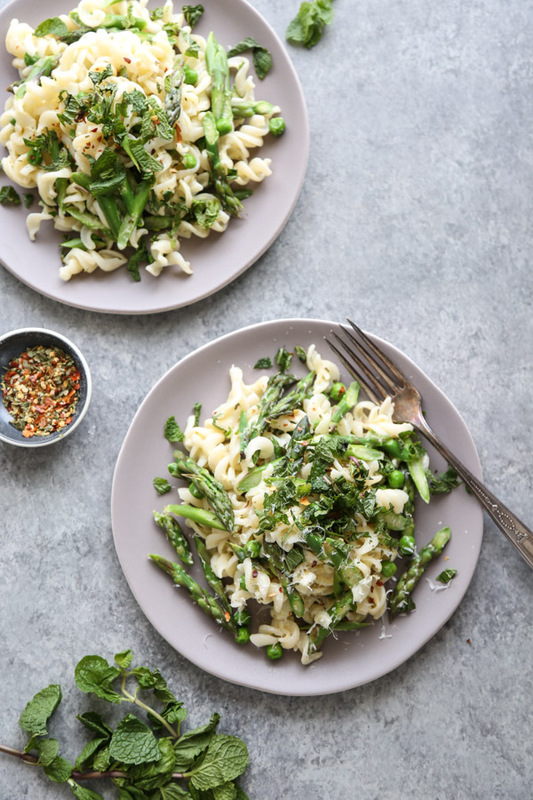 The coauthor of my first cookbook had a genius trick for a single serve vegetarian carbonara pasta recipe that ironically is also a great way to make this usually gloppy, cheese-filled dish a little healthier. Classic carbonara uses the heat from freshly cooked pasta to warm raw egg and grated cheese into a semi-cooked, yet creamy sauce. The recipe for carbonara pasta in our cookbook uses plain Greek yogurt (pretty much 1 single serving cup) instead of the mounds of cheese (though there is some) to make the sauce equally luscious. Since fermented foods benefit from as little cooking as possible, it’s a great way to add probiotic goodness to your pasta carbonara. 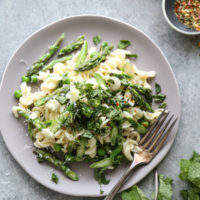 The tangy yogurt is the perfect complement to spicy chili flakes and keeps things bright for spring, especially when the pasta is loaded with asparagus and peas. 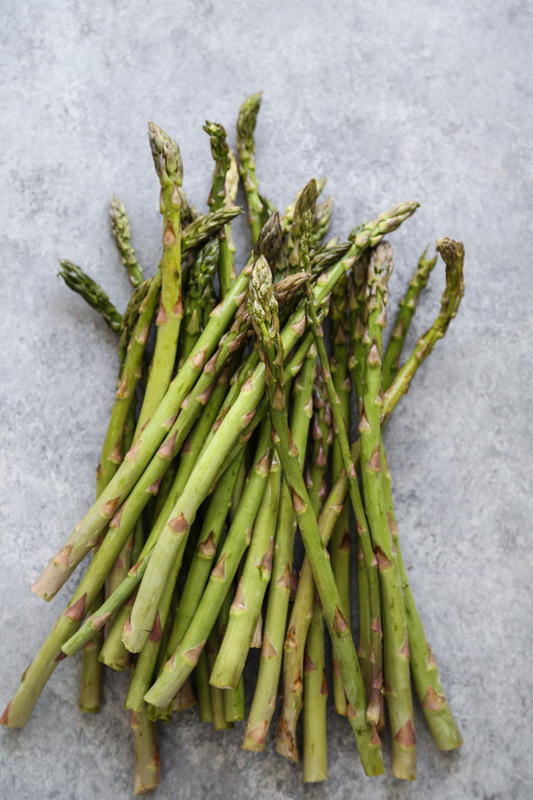 Asparagus was one of those FODMAP foods that took me a while to build back into my diet. For a while last year, I was only able to eat a few spears at a time. This asparagus soup that I made last spring tasted incredibly delicious after 6 months off from so many of my favorite vegetables, but it was so good I ate too much and ended up doubled over in the fetal position. I knew that I wanted to make this pasta for you guys, but I honestly wasn’t sure how it was going to go. So it was a small victory for me when I ate a full serving and felt fine. It’s proof that you have to keep testing and trying, slowly ramping up your quantities until you can really find food freedom. 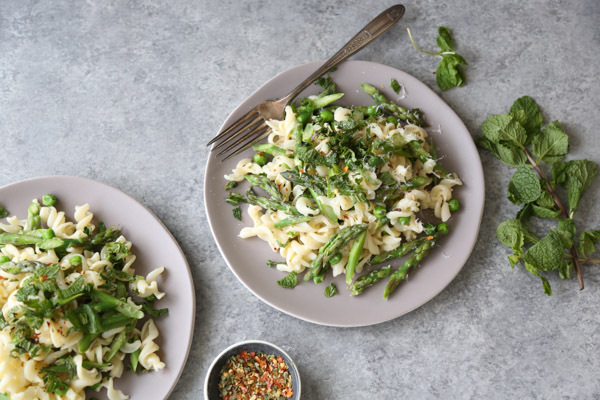 One of the reasons I might have had an easier time with this pasta dish is that I cooked the veggies in the pasta water for a minute or so to take the bite off instead of serving them raw. This was a big learning from last week’s Spring Gut Reset for those who participated. Hot foods, and more importantly, cooked foods, are easier for our digestive system than raw. Especially when you’re reincorporating new ingredients back into your diet, make sure they are a little bit broken down so your tummy doesn’t have to do as much of the work. Speaking of the Spring Gut Reset, holy moley!!! It was incredible. There was so much great community built in the facebook group, and so many people trying new recipes from the site. 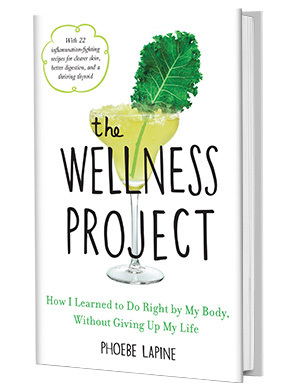 I can’t wait to take all of that good energy into the next session of the 4 Weeks to Wellness course for those who choose to continue the journey with me. 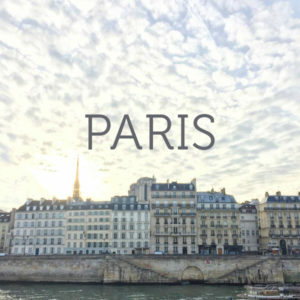 Enrollment for our next session opens TODAY! We start April 29th with a mini vice detox, followed by a full elimination diet. There is a 4-week batch cooking meal plan that includes plant-based/vegan and low FODMAP tracks. 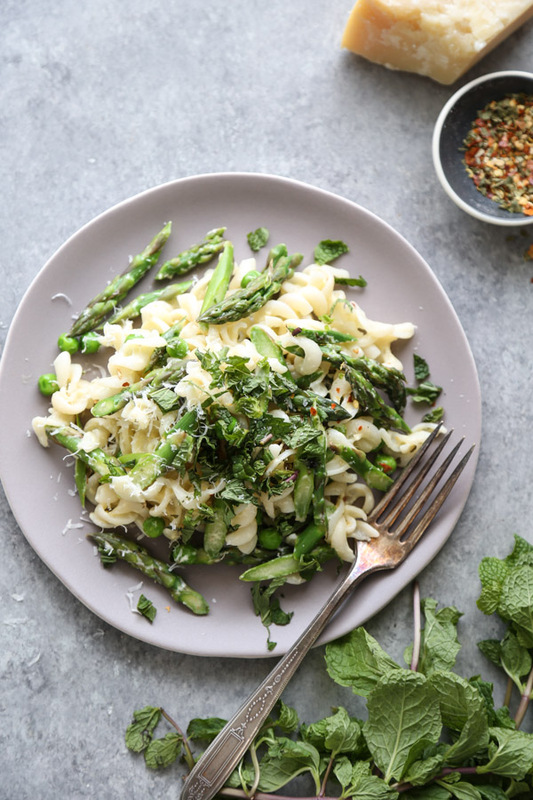 Plus, if you sign up today, you’ll get a FREE additional course cookbook with ultra-seasonal spring/summer options. It’s only for those who sign up in the first 24 hours, so get on it here. As for this vegetarian pasta carbonara recipe: it’s less than 10-ingredients, 20 minutes start to finish, and couldn’t be easier. Fermented dairy products like yogurt tend to be easier to digest for those who normally struggle with lactose. Another reason yogurt comes to the rescue in this recipe! 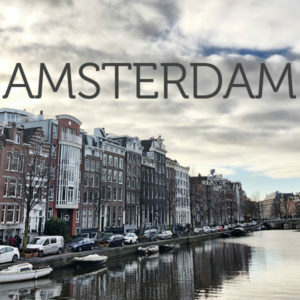 Let me know if you make it in the comments! 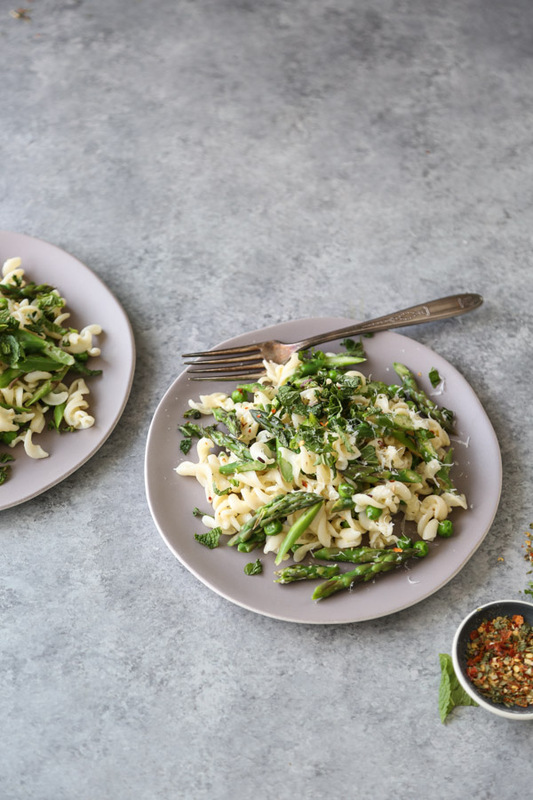 This vegetarian carbonara pasta uses yogurt to give the sauce creaminess without mounds of cheese. 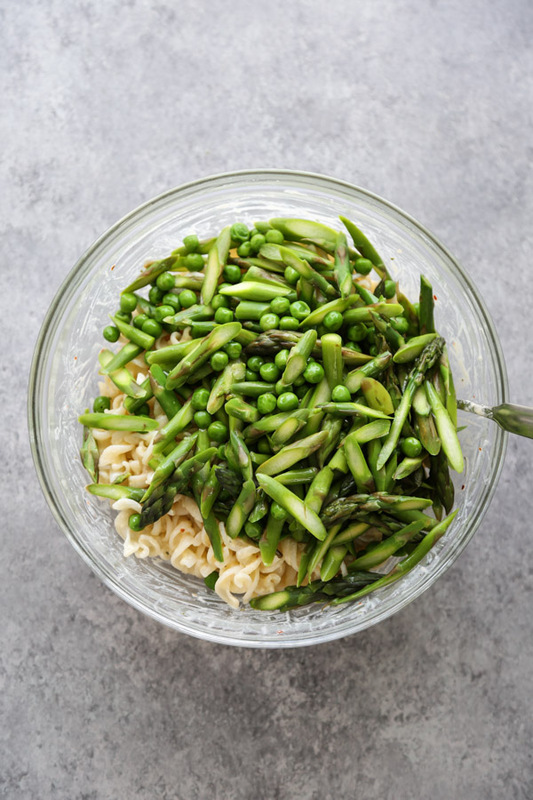 Instead of ham, the pasta is loaded with spring vegetables. 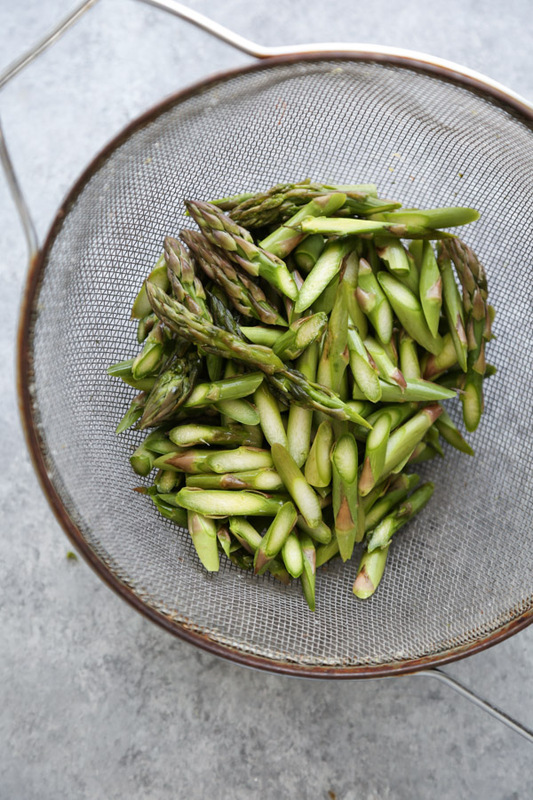 You can substitute anything that’s fresh from the Farmer’s market, but I love that asparagus and peas since they only take a minute of blanching to be al dente. Bring a large pot of heavily salted water to boil. Cook the pasta according to package directions until al dente. 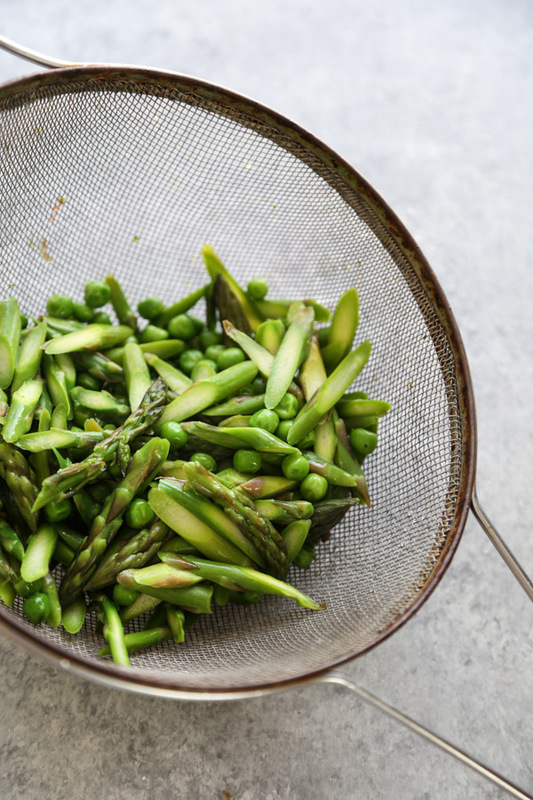 During the cooking process, place the asparagus and peas in a metal fine mesh strainer. 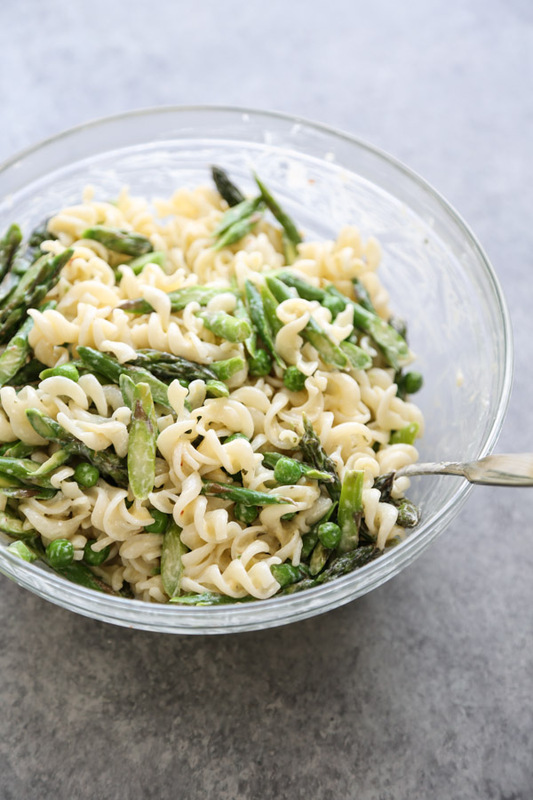 Submerge the veggies in the boiling pasta water for about 30 seconds, or until the asparagus is tender but still bright and crunchy. Remove the colander and rinse the veggies under cold water to stop the cooking. Season generously with sea salt and set aside. 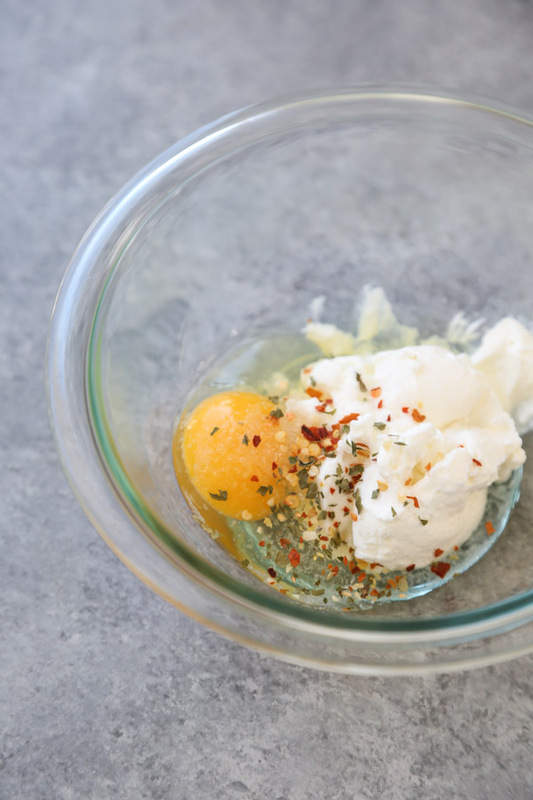 Meanwhile, in a small mixing bowl, beat together the yogurt, egg, 3/4 teaspoon salt, and red chili flakes until smooth. Drain the pasta and immediately add it to the yogurt sauce. 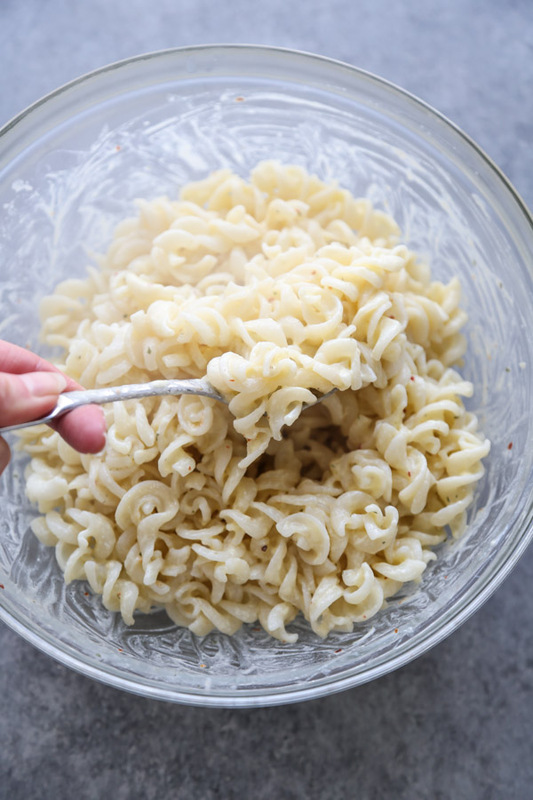 Toss to combine – the pasta will cook the egg and create a creamy sauce. Top with the mint and parmesan, if using. Serve immediately. I forgot to take a picture but I made this last night and it turned out delicious! I used almond milk yogurt so it was dairy free and just let the yogurt sit in a mesh strainer for a little while to lose some excess liquid. And added some leftover salmon we had. This will definitely be added to my rotation! It was so fast and the sauce was creamy and yummy without being heavy or too rich! What a gorgeous pasta! Carbonara is a favorite too! This looks absolutely delicious, thanks for sharing..